Cleansing and detoxing are all the rage. You can have fresh, organic juice cleanses delivered to your door, pick up a detox kit at your local health food store, or follow one of the many do-it-yourself programs endorsed by celebrities such as Dr. Oz, Gwyneth Paltrow, and Oprah. 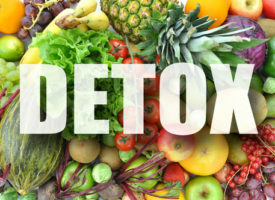 Advocates claim detox diets and cleanses eliminate “toxic buildup in the organs,” resulting in weight loss, energy, clear thinking, shiny hair, vibrant skin, and more. Supermodel Lily Aldridge calls BluePrintCleanse, which costs $65 per day, an important part of her beauty regimen, and actress Julia Stiles raves about how much energy and mental clarity it gives her. Naysayers, on the other hand, say it’s all a bunch of BS. The truth lies somewhere in between. Let’s look at the common components of these increasingly popular cleansing regimens and sort fact from fiction. Many detox/cleanse programs require foregoing food and drinking lots of juice. There’s nothing wrong with laying off food for a few days. Fasting is a powerful therapy that gives your system a break, facilitates weight loss, and lowers blood pressure and blood sugar. However, I wouldn’t recommend any protocol that suggests as many as 12 cups of juice a day. I’ve looked at the nutritional information on some of these beverages, and a day’s worth contains a massive amount of sugar, almost no fiber, very little protein and fat, and about 1,000 calories. Many home detox regimens also recommend lots of juice, and one popular program, the Master Cleanse, consists of six to 12 cups of water mixed with maple syrup (sugar), lemon juice, and cayenne pepper. I’m all for taking a break from your normal diet, but don’t count on it to “rid your body of impurities.” And if you want to go all-liquid, just drink water. Another common feature is an elimination diet, which calls for cutting out sugar, salt, alcohol, caffeine, sodas, grains, and processed foods; drinking lots of water; and emphasizing superfoods such as broccoli, kale, beets, and berries. These diets may also require purchasing special drinks or supplements. This approach is much healthier, less Spartan, and provides many benefits, including weight loss and better blood sugar and blood pressure control. Best of all, it encourages what I consider to be the most valuable aspects of any diet—focusing on your health, being conscious of what you put in your mouth, eating less, giving up junk food, and drinking more water and less alcohol—habits that you hope will stick. But detox? I’m not so sure. Because elimination diets are short term, usually a week to a month, most people return to their old ways. You should be eating a high-fiber, nutrient-dense, vegetable-rich diet every day. 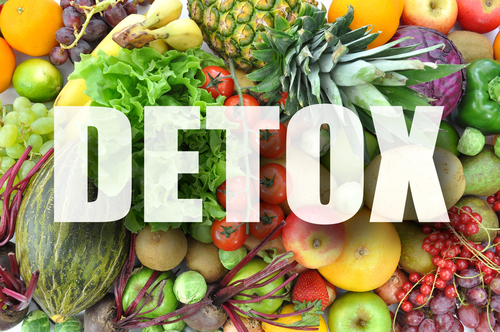 Healthy eating needn’t be as strict as these detox diets. At Whitaker Wellness, we recognize that in the real world, people drink coffee and alcohol and eat red meat, bread, and dessert. We just teach them how, in moderation, these can all be part of a healthy diet—not for days or weeks but for a lifetime. I am often asked about liver and colon cleanses. The former usually refers to a concoction of olive oil, Epsom salts, and citrus juice that’s supposed to flush toxins from the liver and gallbladder. The latter involves fiber, laxatives, and, in some cases, enemas or colon irrigation to “remove accumulated wastes.” I can find no research to support the liver flush or colonic irrigation, and taking laxatives for cleansing is a terrible idea. That doesn’t mean you shouldn’t take steps to support your colon and liver. Fermented foods such as yogurt and probiotic supplements nurture beneficial gut bacteria, and high-fiber diets and supplements improve elimination and bind to toxins in the gut. To give your liver a break, go easy on alcohol and medications and get serious about weight loss. Non-alcoholic fatty liver disease, which can lead to serious liver dysfunction, is closely linked with obesity and diabetes, and diet and exercise are the best therapies. I also recommend taking a really good multivitamin and mineral supplement. The liver doesn’t filter out toxins but converts them into less-toxic compounds that can be eliminated by the kidneys and colon. This process requires glutathione, which neutralizes toxins and protects the liver. Supplemental selenium and vitamins C and E help activate and recycle glutathione, and milk thistle (silymarin) and alpha lipoic acid enhance liver health and are a must for anyone dealing with liver dysfunction. Multivitamins also help protect against the ill effects of toxins throughout the body. Many heavy metals and chemical pollutants cause cellular damage via oxidative stress, so supplemental antioxidants are essential. Cellular “housecleaning” requires folic acid and vitamins B6 and B12. Magnesium, calcium, and zinc reduce the absorption of heavy metals in the gut. Zinc helps negate cadmium toxicity, and a robust vitamin C status is associated with lower blood levels of lead. Other supplements that may help remove or protect against toxins include chlorella, spirulina, garlic, and citrus pectin. For some people, serious heavy metal and chemical toxicity caused by acute or chronic exposure or an inability to efficiently clear toxins from the body is an unrecognized cause of a wide range of physical and mental problems. At Whitaker Wellness, we test patients with stubborn health challenges that no one can get to the bottom of—and in many cases find they have sky-high levels of lead, mercury, or other toxins. Treatment with a course of chelation, which removes heavy metals from the body, is an underutilized therapy that can yield remarkable results. In summary, if a three-day cleanse (preferably a water fast) or a 10-day elimination diet makes you feel good, lose a little weight, and gets you on the road to a healthier lifestyle, I’m all for it. And chelation therapy can help turn around significant health problems. But never forget that your body’s remarkably effective detoxification system is working 24/7, whether you’re cleansing/detoxing or not. It’s the small steps you take every day to improve your health and support your all-important organs of detox that really make a difference. Steer clear of obvious sources of toxins, eat a fiber- and vegetable-rich diet, and drink a lot of water. Suggested supplements include a potent daily multivitamin (look for one that contains selenium 200 mcg, zinc 30 mg, vitamin C 1,000+ mg, vitamin E 200 IU), alpha lipoic acid 600 mg, and silymarin/milk thistle 900 mg.
For more information about diagnosis and treatment of heavy metal toxicity at Whitaker Wellness, call 866-944-8253 or fill out this form for a complimentary consultation with one of our friendly and knowledgeable Patient Services Representatives.